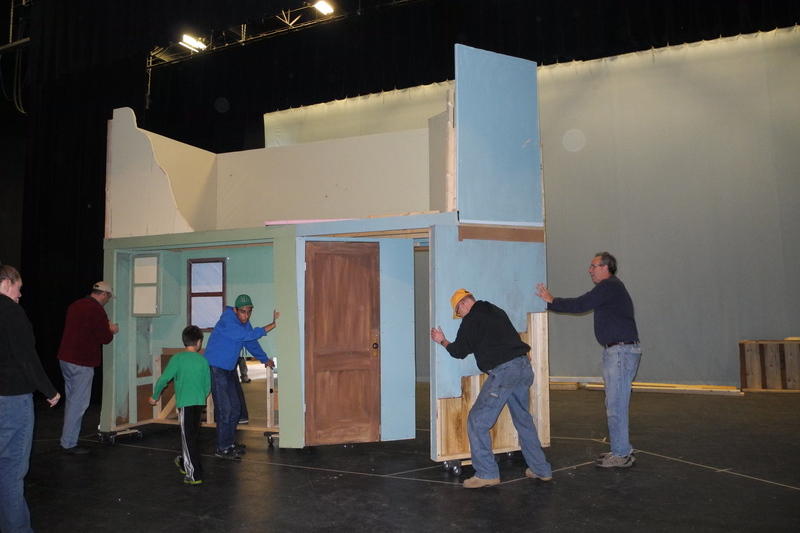 Moving the production of A Christmas Story to the Performing Arts Center (PAC) at Evansville High School has been a “two step forward, one step back” transition. We knew that would be the case when we negotiated for the space. Rick, Lyman, and Scott plan, or conspire. We started our rehearsals this past week in the PAC on a bare, large stage with only tape on the floor to indicate where the set pieces would go. 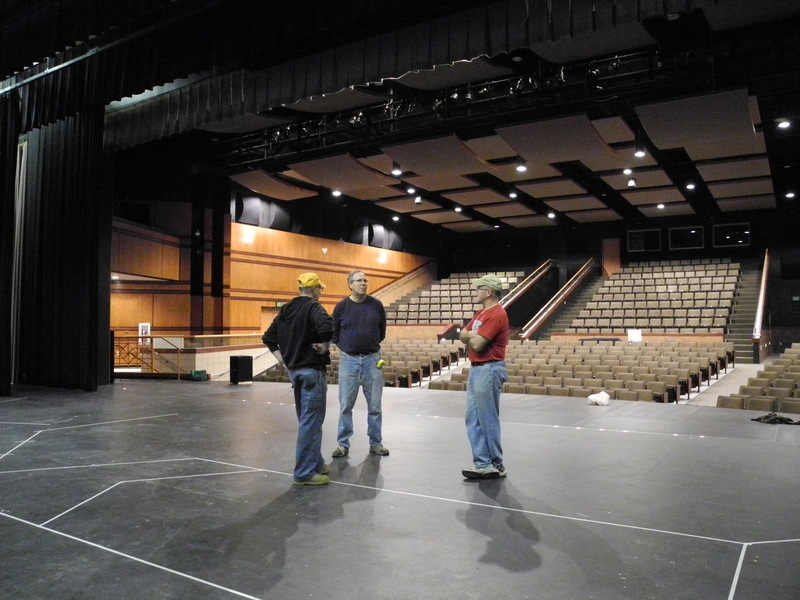 The stage at the PAC is twice the size of the auditorium where we had been practicing, so the first order of business was to work on the blocking for the large stage. Blocking could also refer to our move into the PAC. The second graders have a choir concert there this week so we can’t put any of our set onto the stage. However, the PAC has a scene shop and ample wings that allowed us to move our stuff in. After a couple of loads were delivered from the storage area, the stage was littered with the various wood frames that make up the Parker House, the main set piece. Scott (who designed the original set) and I looked at pictures and deciphered where each piece of the puzzle needed to go, grabbed a couple of screw guns, and went to work. Clark and Rick, veterans of this set piece, joined us, as well as several others. 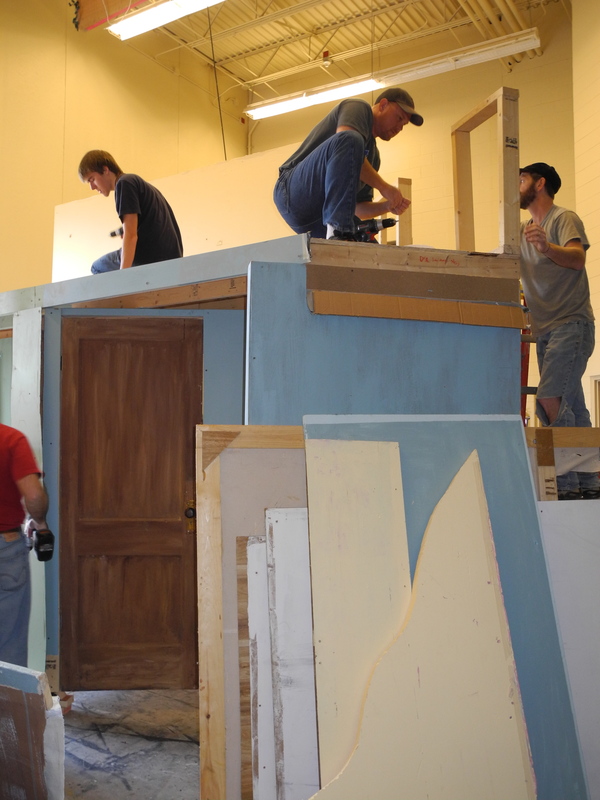 Many who were new to set building, but not new to building things, pitched in and in an hour the pieces that littered the stage were reassembled. 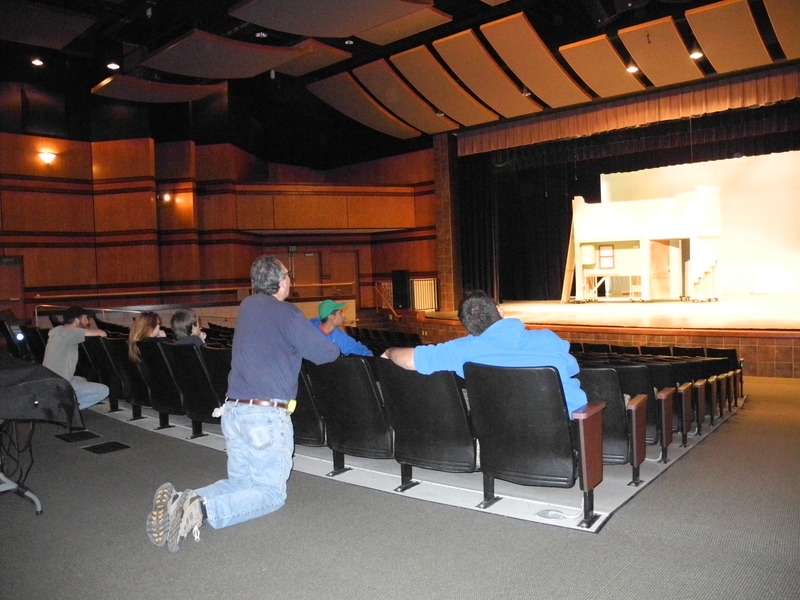 The set piece that takes up the whole Middle School stage looked small on the PAC stage. Parker house on the move. We couldn’t leave it there, so a large group lifted the set and put it on mover’s dollies and we wheeled it into the scene shop to wait until next weekend. That’s when the next movement on stage will happen. We’ll bring it back and remove the dollies, re-paint, add flats, and complete our set. 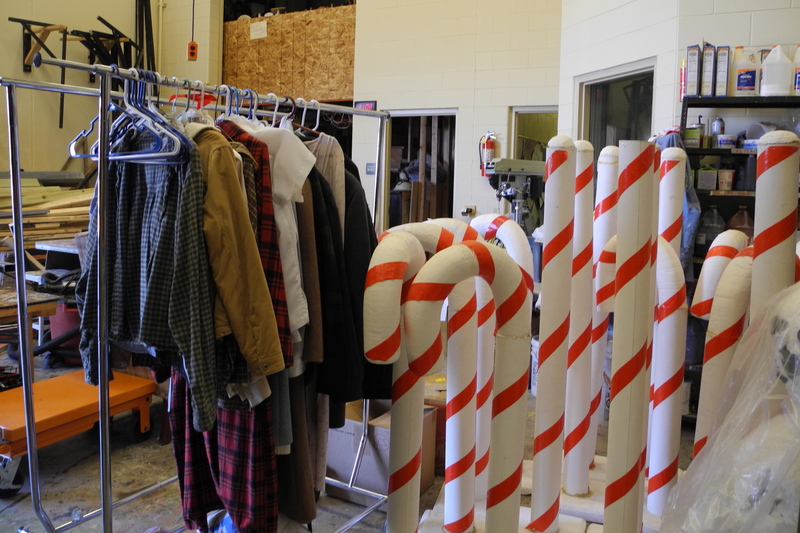 Once done, the light crew will come in and start placing and focusing lights, Melissa will start setting up tables in the back to place the props, the set pieces that need to roll on and off for different scenes will be staged in the wings, and the costumes will be hanging in the green room. The Parker House in its new home. The group discusses ideas for improvement. When we return to the PAC in a week, rehearsals will have a different feel — a sense of urgency will creep in. This is becoming a real play, and opening night will be upon us before we know it.